Lymphocele has been reported after a variety of different procedures. Typically, it occurs after pelvic lymphadenectomy or renal transplantation but has also been observed after retroperitoneal lymphadenectomy or aortic graft placement. Etiologic factors associated with lymphocele development include transected lymphatics, increased lymphatic flow, delayed healing, or deficiencies with the intrinsic clotting mechanism. Specifically, these include prior radiotherapy, extensive dissection, lack of peritoneal communication, reoperations, and the administration of perioperative minidose heparin, diuretics, high-dose steroid medication, or immunosuppressants. The surgical approach, the number of transected lymphatics around renal grafts, and transplant rejection episodes are also factors associated with the development of lymphocele (1-4) Whatever the causative agent(s), the result is accumulation of lymphatic fluid in an epithelialized, confined space, which may or may not result in symptoms. Studies have shown that both open and laparoscopic pelvic lymphadenectomies result in similar amounts of lymph node extirpation (5). However, open pelvic lymph node dissection for prostate cancer has been reported with a lymphocele formation rate of 3.2% to 14.8% (3,6,7). Additional studies have focused on the occurrence of lymphocele formation after laparoscopic transperitoneal lymphadenectomy for prostate cancer. Earlier observations by Fried et al. reported on symptomatic lymphoceles after laparo-scopic transperitoneal lymphadenectomy and noted a 3.5% incidence in a group of 57 patients when compared with 6.5% incidence of lymphoceles after extraperitoneal laparoscopic transperitoneal lymphadenectomy (8). More recently, additional authors have reported rates of 1.1% in a large series of 177 laparoscopic transperitoneal lymphadenec-tomys in comparison to 1.54% to 2.4% after laparoscopic extraperitoneal approach (9,10). The exposure to the peritoneal surface results in the absorption of lymphatic fluid and forms the basis of surgical therapy for lymphocele treatment through either an open or laparoscopic approach. 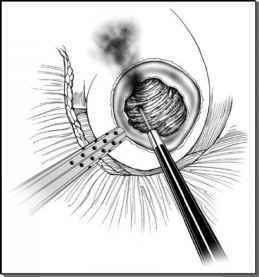 Traditionally, treatment of a lymphocele required open surgical fenestration to allow the lymphatic drainage to be reabsorbed by the peritoneal cavity. However, since the initial description by McCullough et al. in 1991, along with technologic advances and increased surgical experience, laparoscopic marsupialization of lymphoceles is now the proposed first-line approach (11,12). Since the initial description by McCullough et al. in 1991, along with technologic advances and increased surgical experience, laparoscopic mar-supialization of lymphoceles is now the proposed first-line approach.